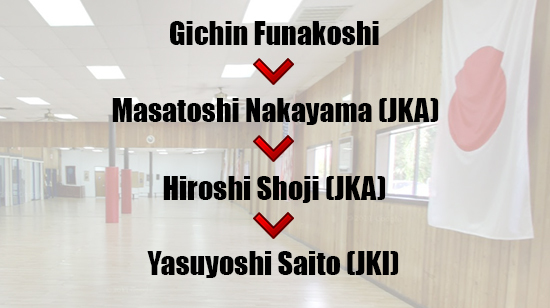 At Japan Karate-Do International, we practice karate handed down from Masatoshi Nakayama to Hiroshi Shoji to Yasuyoshi Saito. 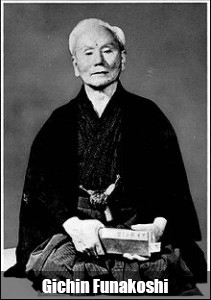 Shotokan is a style of karate, developed from various martial arts by Gichin Funakoshi (1868-1957) and his son Gigo (Yoshitaka) Funakoshi (1906-1945). Gichin was born in Okinawa. and is widely credited with popularizing karate through a series of public demonstrations, and by promoting the development of university karate clubs. Masatoshi Nakayama (April 13, 1913 - April 15, 1987) was an internationally-renowned Japanese master of Shotokan karate. He helped establish the Japan Karate Association (JKA) in 1949, and wrote many textbooks on karate, which served to popularize his martial art. For almost 40 years, until his death in 1987, Nakayama worked to spread Shotokan karate around the world. He was the first master in Shotokan history to attain the rank of 9th dan while alive, and was posthumously awarded the rank of 10th dan. Hiroshi Shoji (8th dan 1931-2003 was another Karate Master who helped propel J.K.A. to internation acclaim. Upon graduation from Takushoku University Mr. Shoji dedicated himself to Karate winning the all Japan Karate-Do Championship a number of times and he is the only man to achieve a perfect "10" score in the history of championships. Mr. Shoji was Yasuyoshi Saito's Sensei. Saito Sensei is the Chief Instructor for Japan Karate-Do International.